Donald Trump fields a question during the first Republican presidential debate, hosted by Fox News and Facebook at the Quicken Loans Arena Thursday in Cleveland. Donald Trump is a master at playing off the public’s distrust for the news media, portraying every negative story as a needless distraction from his quest to “Make America Great Again.” You’d think this strategy would become tiresome, but there’s a market for it, especially among Republicans, who are more distrustful of the mainstream media than Democrats. 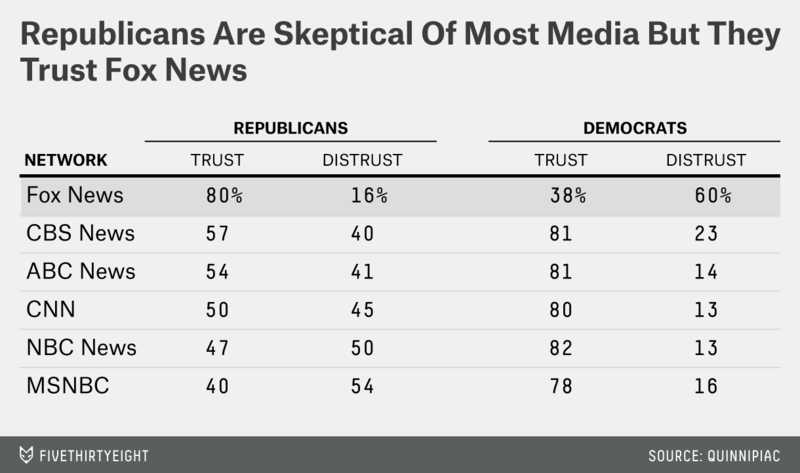 But one exception to this distrust is Fox News, which hosted the first GOP debate in Cleveland last night. According to a March Quinnipiac poll, 80 percent of Republicans say they trust Fox News either “a great deal” or “somewhat,” as compared to 16 percent who say they trust the network “not so much” or “not at all.” Those numbers are almost identical to the high marks Democrats give MSNBC and the other news networks. So a Republican complaining about unfair coverage from Fox is like a Democrat complaining she’s been thrown under the bus by MSNBC (or at least anyone at MSNBC other than Joe Scarborough). Regardless of the merits of the case, the plea is likely to fall on deaf ears. But that didn’t stop Trump from attacking Fox after last night’s debate. Trump told reporters that Fox anchor and debate moderator Megyn Kelly had “behaved very badly” and that the questions he received were “inappropriate.” One of Trump’s lawyers, Michael Cohen, went a step further, alleging the debate and the post-debate coverage had been a “setup” by Fox News. I personally thought Kelly and her co-moderators did an excellent job with the debate. They were tough on Trump, but they were tough on many of the candidates, and candidates like Trump who are polling as frontrunners often receive somewhat more scrutiny. So let me put this very carefully. It might not be paranoid of Cohen to worry that there are powerful forces out to get his boss. Consider the case I made yesterday for why Trump’s candidacy is eventually doomed: Most importantly, the Republican Party is vehemently opposed to his nomination, a wee bit of a problem for Trump since it’s the Republican Party’s nomination to bestow. Yes, there are rules that govern the nomination process, but it’s the Republican Party that establishes the rules, interprets the rules and, if it absolutely had to, could change the rules. In the (unlikely) event that Trump survived the campaign long enough to have a mathematical chance at the nomination, influential members of the Republican Party would be expected to coordinate — some might even say conspire — to deny it to him. The party has a lot of other tricks to deploy before it comes to that, however, including working to influence the tenor of the media coverage of the campaign. Does that mean Fox News is part of the Republican Party’s coordination process? That’s a complex subject. It’s not quite that Fox News is taking orders from the GOP, so much as that they’re an unofficial part of the GOP as a political scientist might (broadly) define the party. Furthermore, large media organizations like Fox News are complex places. There are reports of disagreements between Fox News president Roger Ailes and parent company News Corp.’s executive chairman, Rupert Murdoch, about how the network should cover Trump, for instance. There are undoubtedly disagreements among various reporters, anchors and producers within Fox News, which variously produces excellent nonpartisan journalism, explicitly partisan opinion shows and a lot of things in between.